Cabo is a dive playground right in Southern California’s backyard. A quick flight from LAX, Cabo offers something for everyone whether traveling with family or friends. The town is infamous for an intense party scene, however many don’t realize that Cabo also offers affordable and relaxing family vacations hanging by the resort pools and the beach. Visitors can choose between Cabo San Lucas or nearby (and quieter) San José del Cabo, as well as a retreat to Cabo Pulmo where interruption would only come from the occasional pelican diving into the aqua water after a fish. The local airport is San Jose Del Cabo (SJC) in Los Cabos (the municipality for Cabo San Lucas and San José Del Cabo). The drive is about an hour from the airport to Cabo San Lucas, and just over an hour in the other direction to Cabo Pulmo. Hotel shuttles and rental cars are readily available, putting divers in their room (or in the water) just hours after boarding the plane. This is a great setup for underwater photographers who want a long weekend of diving and shooting, or for divers looking to blend family fun time with a few memorable dives. Early morning view of Cabo San Lucas and several of the dive spots located near Land's End, where the Pacific Ocean meets the Sea of Cortez. 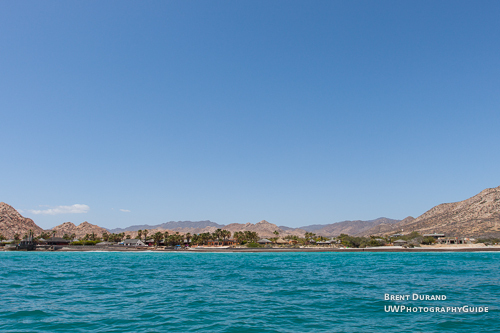 The changing seasons bring about different water conditions and marine life, whether in Cabo San Lucas or Cabo Pulmo. 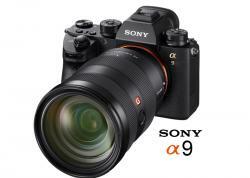 This is great for underwater photographers because each season will have you looking for different photo subjects. Like many dive locations, conditions can change quickly depending on the weather. I dove Cabo in April with 50ft visibility, but two days later it was considerably less. Cabo is sunny except for a few odd days, so bring your sunscreen. The best dive season is October – November, when the water warms up to tropical temperatures and visibility can rival classic dive destinations. Many divers flock to Cabo for a chance to see hammerhead sharks in the Corridor or at El Bajo (near La Paz), whale sharks in the Sea of Cortez and much more. December – March brings excellent diving. There are often humpback and grey whales, making the transition from the Sea of Cortez into the Pacific Ocean, along with sea lions and schools of mobula rays to dive with. 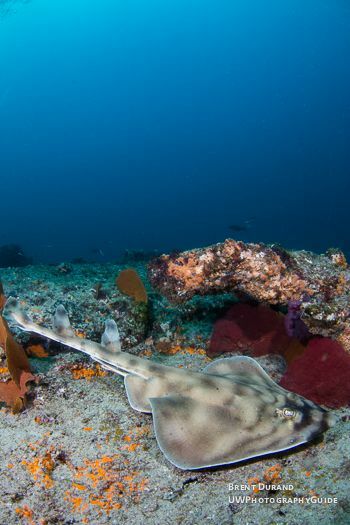 The colder water of winter and spring also brings banded guitarfish & bullseye rays, octopuses many other critters up from the deeper waters to recreational dive depths. Throughout the year, divers and photographers can expect to see fish – large schools, tiny fish in coral heads and large fish like groupers. Sharks (ie white tip reef sharks) and turtles also come by to model for u/w photographers, while nudibranchs and blennies keep the macro photographers' eyes on the reef. Moorish idols graze across the reef - a common sight in Cabo San Lucas and in Cabo Pulmo. 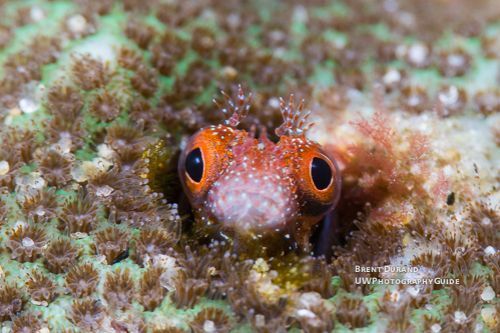 Blennies are abundant in Cabo, keeping a close watch on visiting macro photographers. 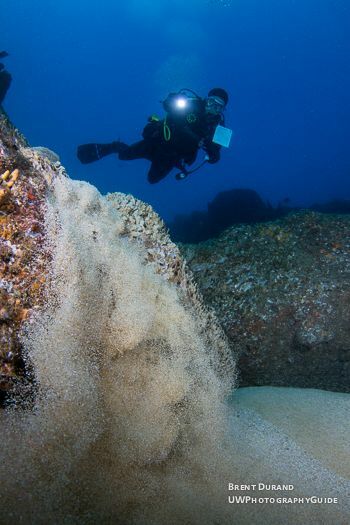 North Wall: The North Wall offer a steep sandy slope interspersed with rock fingers descending beyond rec dive limits. 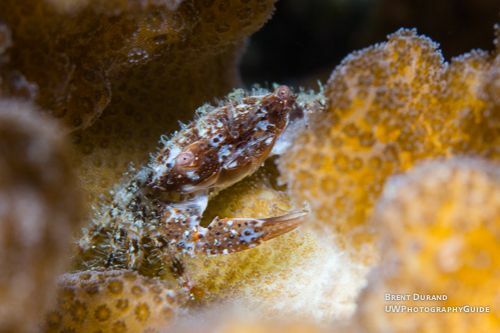 Divers can look around the rocky areas of the slope for zebra and jewel eels, stingrays, puffer and box fish, cornetfish and trumpetfish and macro life like seahorses & blennies). 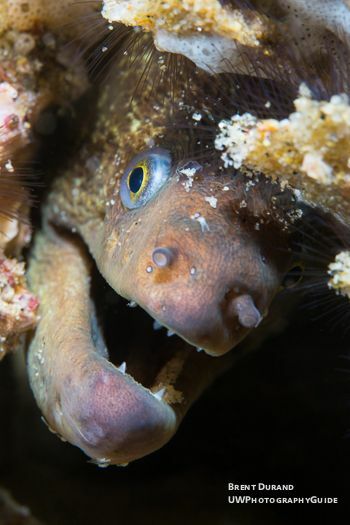 Communities of cortez garden eels often stick their heads out of the sand until divers come close. 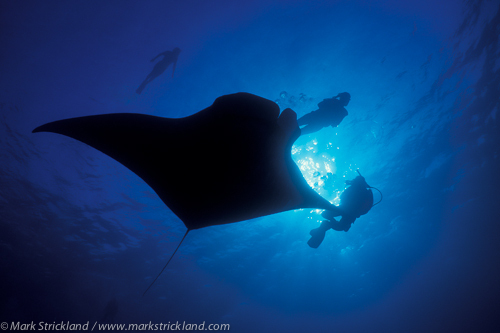 It's also common to see big schools of fish, sharks and large rays out in the open water. 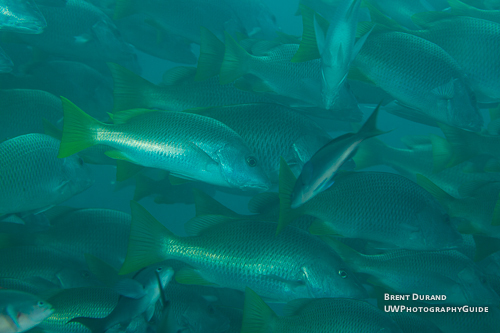 Pelican Rock: A rich dive site with a resident school of snapper just outside the pinnacle. A classic feature here is the infamous Sand Falls, a unique sand waterfall caused from the steep slope and rock formations down around 50 feet. 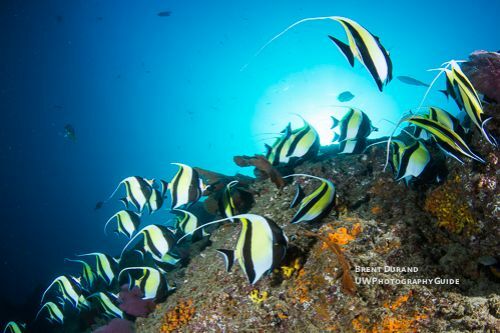 As divers ascend, they can spend a safety stop searching the right and backside of Pelican Rock for abundant nudibranchs, seahorses, moray eels, seahorses, octos and blennies or sit back and watch schools of Moorish Idols grazing across the reef. Neptune’s Finger: Neptune’s finger looks just like its name – a large, finger-like rock jutting out into the sky from deep in the ocean. Banded guitarfish and rays come up from the depths during the spring while the water is cooler, and divers will always see big schools of fish, sea fans and other life to keep the shutter moving during the gradual ascent along the wall back to the surface. Land’s End: Diving between the two large pinnacles at Land’s End, this site merges the Sea of Cortez and the Pacific Ocean. Resident Sea Lions, diving cormorants, massive schools of baitfish and pelagic fish are all common here. 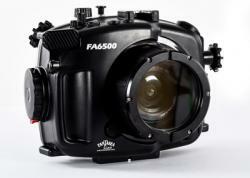 A must-dive for underwater photographers, especially since there's less dive pressure on the site. The Corridor: A 20-minute boat ride brings you to the corridor, where you never know what you’ll see. 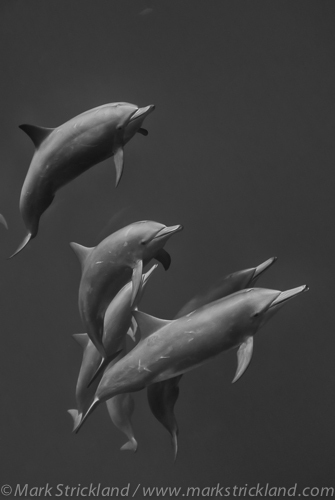 The site presents a unique opportunity for drift dives and high likelihood for encounters with pelagic fish, sharks and more. Divers might even find themselves next to a whale! 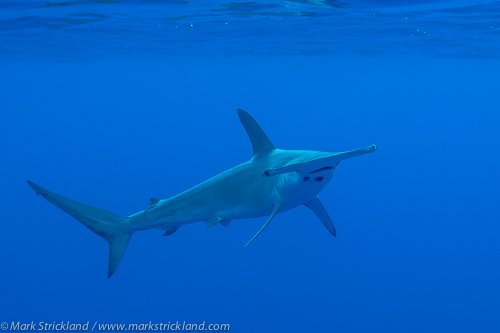 Gordo Banks: In a word, hammerhead sharks. These fish are the star of the show, attracted to the abundant fish life on the underwater bank. In addition to these massive schools, divers often see schools of jacks and snapper, big rays and pelagic fish like tuna and rays. The boat ride is about 1 hour each way, but well worth it if these photo subjects are known to be around. 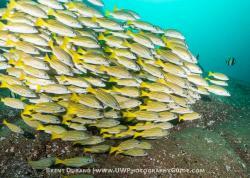 Dense schools of fish are common, like these yellow snapper. Photo left: A diver moves in for a closer look at the Sand Falls. 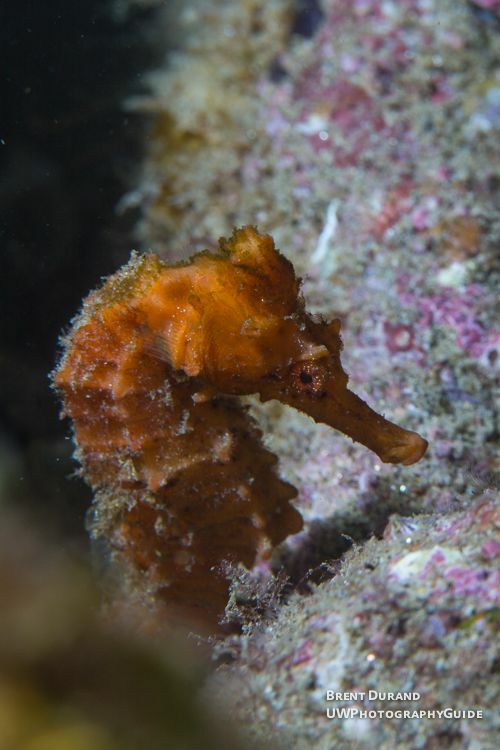 Photo right: A Seahorse hides under a pile of rocks, making for tough but rewarding macro shooting. They often sit right out in the open. Nudibranchs like the Glossodoris sedna are common in the Sea of Cortez. 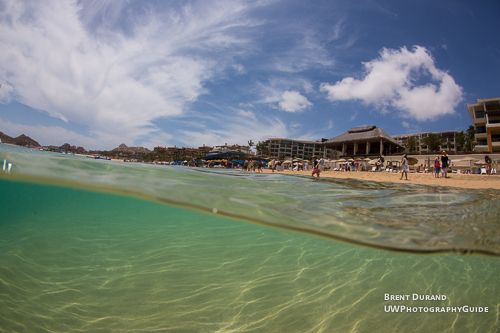 It's always worth it to spend some time looking inside the coral heads at Cabo. You never know who might be looking out at you. 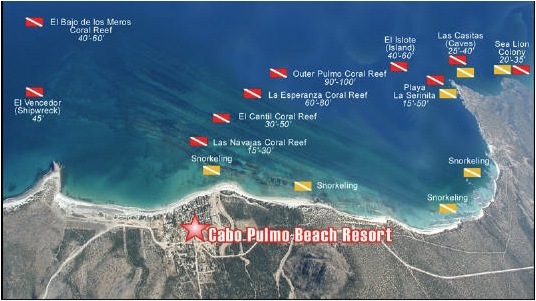 Cabo Pulmo is one of only 3 coral reefs on the west coast of North America. 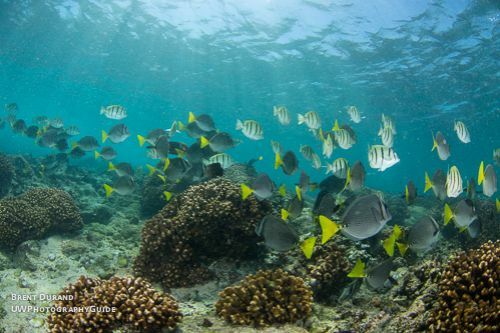 It became a marine preserve in 1995, and the result is a thriving reef which projects from Cabo Pulmo into the Sea of Cortez in massive fingers. 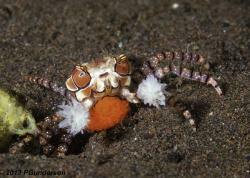 Over 6000 species can be found here, sure keep wide-angle and macro photographers very busy for many dives. An hour drive from the airport or 2 hours from Cabo San Lucas, this is a must-dive location for visiting underwater photographers. The local dive sites sit in the bay, and Cabo Pulmo Dive Center uses their many years of experience to drop divers right onto the best parts of the reefs. Because of the open water, advanced divers can do drift dives along the reef, making for a very comfortable tours with easy fin kicks. Since many of the dive sites are in open water, the DMs deploy an SMB during saftey stops so that the panga will be right there upon surfacing. Diving with gloves is not allowed in the marine park, which helps keep the reef in pristine shape. 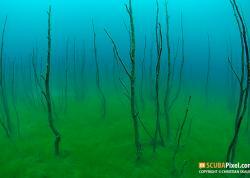 El Bajo: This is a rich reef with many types of coral in about 55 feet. Giant grouper, angelfish, rays, moray eels and fish of all sizes can be seen here, either darting in and out of coral heads or swimming by in massive schools. Whale sharks also pass by during the fall, and humpbacks and mobula rays during the winter. 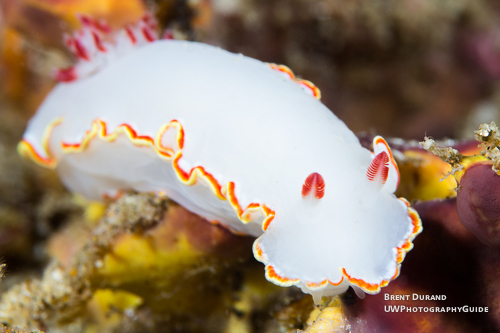 El Cantil: A fantastic drift dive that offers bountiful macro life for photographers. Another drift dive, divers drift along a wall exploring the nooks and crannies for ocean life of all sizes. The reef is very large and would take several dives to see the entire structure. Frailes Rock Sea Lion Colony: This resident sea lion colony can only be accessed by boat or kayak, for diving or snorkeling. This makes it a great snorkeling spot for family members who may not be scuba diving, or for advanced divers looking to spend some time with new barking friends. Keeping an eye out towards the open Sea often rewards divers with pelagic fish sightings. One note is that snorkelers are required to wear flotation vests while swimming in the marine park. Don't book a snorkel tour if you're planning to freedive. Other Dive Sites: Cabo Pulmo has many more dive sites shown on the map above, so we’ll leave it up to you to book your trip and check them out for yourself! 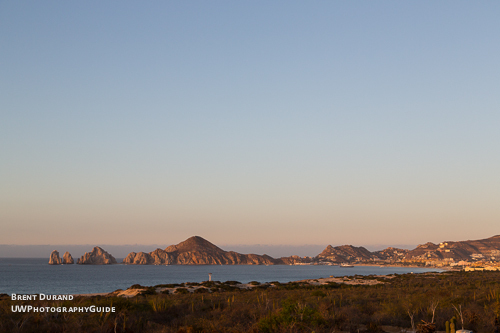 Cabo Pulmo is a peaceful oasis in the middle of the Baja desert. Aqua waters greet day-trip divers and underwater photographers (from CSL) and become home for those wanting a multi-day diving retreat. 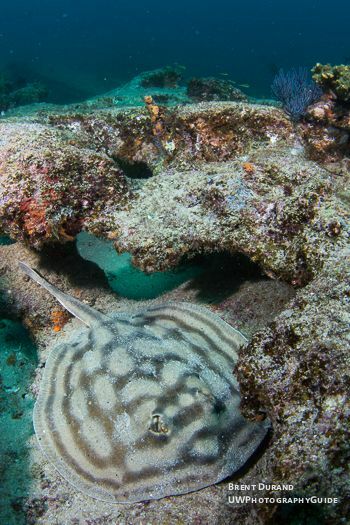 Photos: Rays are among the 6000 species found at the Cabo Pulmo coral reef, which is the only living coral reef in the Sea of Cortez. 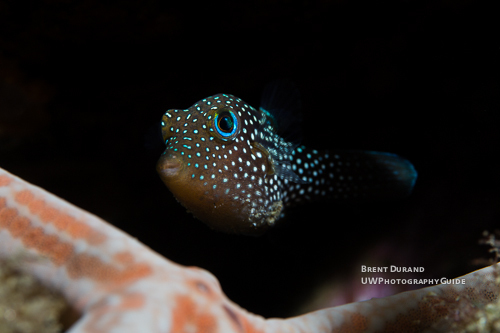 A spotted sharpnose puffer peers out at divers admiring the pristine reef at Cabo Pulmo. 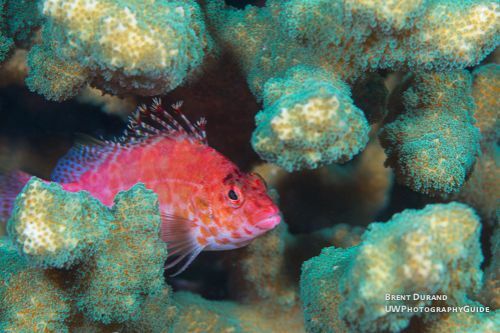 Many fish live in and around the coral heads, offering plenty of subjects for macro photographers. Moray eels are common among the rock structure of the reef. Lodging: There are many lodging options in Cabo San Lucas to suit any budget and trip agenda, whether diving as much as possible or making a couple dives in-between family activities. Some dive operators even offer dive and stay packages. San José del Cabo has several hotels, but divers would have to drive into Cabo San Lucas (or Cabo Pulmo) to dive. A quick search on a site like Tripadvisor will bring up many options. Cabo Pulmo has several options available through Cabo Pulmo Beach Resort and various other homes for rent (great for families or larger groups). Dining: As with lodging, there are many options in Cabo San Lucas. There are many nice restaurants along the marina with everything from seafood to steaks to burgers. Many even feature live music. Those seeking more adventure can explore deeper into town for great mexican food, often eating alongside locals, American expats and other visitors. Asking the folks at the dive shop for recommendations is also a great way to find awesome restaurants off the beaten path. Activities: Contrary to many scuba diving locations, Cabo San Lucas offers much in the way of non-diving activites. Besides the ocean-view restaurants and bars, there's parasailing, kayaking, swimming & snorkeling, fishing, golfing, sailing and more. Renting a car is worthwhile during your stay. It give divers the freedom to explore the area, driving easily from Cabo San Lucas to Cabo Pulmo, and to check out quiet snorkeling beaches like Chileno Bay, where this photo was shot. The ocean-front bars at Moreno beach in Cabo San Lucas make for excellent people-watching once the dive day is over. Manta Scuba: Manta has a great reputation in Cabo San Lucas and lives up to the rep. 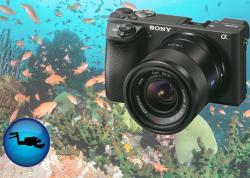 They are a PADI 5-Star dive resort and recently won a PADI award for continuing education certs. With a friendly staff, several dive boats and expert dive knowledge, they offer great dives for new or experienced divers. Let the Manta team know you’re a photographer with specific interests as you’re booking your dives and they’ll make sure you step onto the dock smiling. Cabo Pulmo Beach Resort & Dive Center: Cabo Pulmo Dive Center has the perfect setup for diving the area and is also a PADI 5-Star resort. After watching them launch the pangas "Cabo Pulmo style" and being dropped right onto the best spots of the reef you'll see why. In addition to the dive shop, pool and showers, they offer bungalows for those wishing to stay in Cabo Pulmo. Cabo Pulmo Dive Center offers a daily shuttle to pick up divers in Cabo San Lucas and San José Del Cabo for a day in the water. An ocean-view restaurant, Coral Reef, sits on top of the shop – a perfect way to fuel up after a morning of diving. Ready to book your dive trip to Cabo? The team at Bluewater Travel can make the best recommendations and find the best pricing to make your trip a vacation to remember.